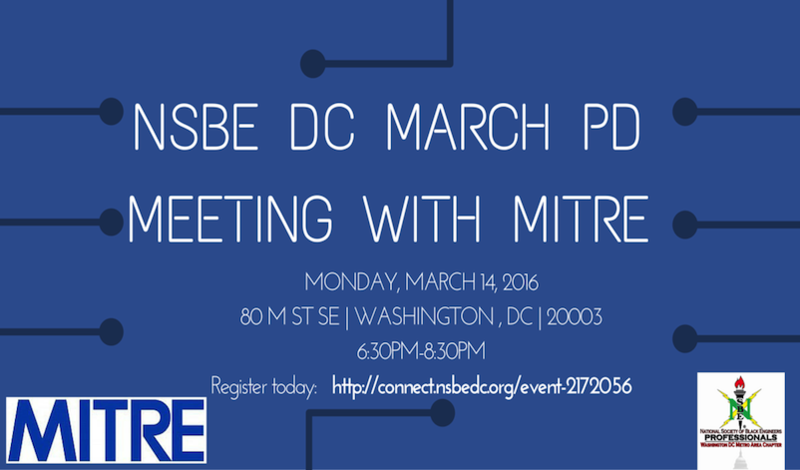 Join NSBE DC for our March Professional Development (PD) Meeting with MITRE on March 14th! Come out and learn more about MITRE and participate in Q&A with Program Directors, VPs, Project Leaders, and more! This will all serve to give you a day-to-day look at working for MITRE! There will be food and refreshments served. Cost is free for NSBE DC members and $10 for the public. Meet Our MITRE Panelists and Moderators! Contact Shelton Liddell at pd@nsbedc.org for more information.